What in the world is happening in Cyprus? Cyprus will overhaul its failing banking sector and raid state and church coffers in a bid to unlock a €10 billion bailout from the European Union and avoid financial collapse. The island nation's banks are being kept afloat by emergency funding from the European Central Bank, but that will cease on Tuesday without a deal, threatening Cyprus' membership in the eurozone. Officials have been scrambling to find ways to raise €5.8 billion since the country's parliament threw out an unprecedented plan to tax bank deposits earlier this week. Without the money, Cyprus can't access the rescue offered by the EU, and two of its biggest banks are likely to fail. Eurozone finance ministers said Thursday they were ready to discuss a new proposal with Cypriot authorities, and said it should be presented "as rapidly as possible" and respect the parameters of the original rescue. Lawmakers in Cyprus were due to discuss key elements of the proposal Friday. It was not clear late Thursday if the proposal would include a tax on banks. But the country's central bank said deposits up to €100,000 would be protected, honoring an existing guarantee. State TV said parliament would also vote on giving authorities the power to limit bank withdrawals to prevent a potentially catastrophic flight of funds when banks reopen for business Tuesday for the first time in 10 days. Cypriots have been queuing at cash machines since the proposed bank account levy was announced Saturday. Cyprus has been brought to its knees by the losses that its oversized banking sector sustained on investments in Greece, and a deep recession. Eurozone policymakers want it to find €5.8 billion as part of a rescue to ensure the country's debt doesn't soar to unsustainable levels. The total funding required to recapitalize the banks and meet government commitments is almost equal to the country's annual gross domestic product. At the heart of the plan is a proposal to create an "investment solidarity fund," or sovereign wealth fund, that would pool state and church assets, including real estate and pensions. It also includes splitting the country's second largest bank, Laiki Bank (also known as Cyprus Popular Bank), into so-called good and bad banks. The Open Europe think tank estimated this could reduce the recapitalization bill by between €1 billion and €2 billion, but still left many questions unanswered. "The cost of financing and winding down the bad bank will be large, who will finance it? Some reports suggest it could be the uninsured depositors -- this may work but is likely to cause outcry amongst foreign investors and some Cypriot businesses," Open Europe noted. Cyprus' credit rating, already deep in junk territory, was cut further by Standard & Poor's to "CCC" with a negative outlook. The agency cited the acute problems in the banking sector, the prospects of an even deeper recession and the impact on government debt. 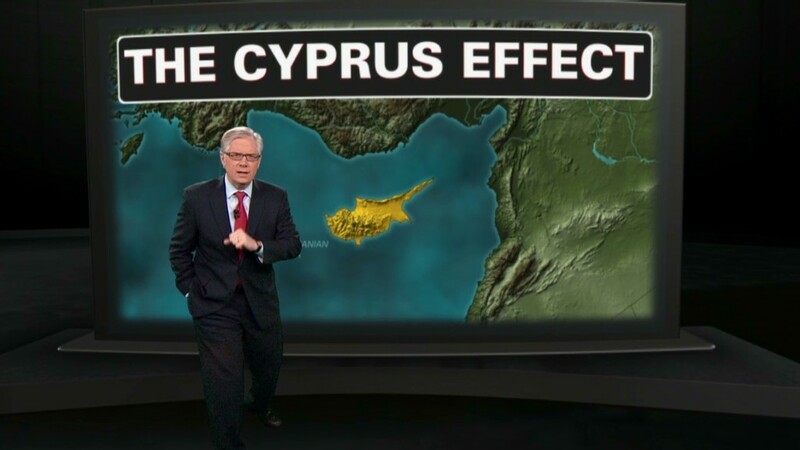 Related: What next for Cyprus? The proposed tax on all bank accounts, including deposits covered by the national guarantee scheme, outraged Cypriots and prompted widespread condemnation for undermining the principle that ordinary savers should not pay for bank failures. But the EU is likely to insist that any deal include a bank levy on amounts above the €100,000 limit on guaranteed deposits because it believes wealthy foreigners who have profited from Cyprus' low tax rates should contribute. More than half of bank deposits are held by foreigners, many of them Russian. "I still think it is probably inevitable there will be some kind of levy in the final package which we will agree upon," said Dutch finance minister Jeroen Dijsselbloem, who chairs the meetings of eurozone finance ministers. Russia may ease the pressure by agreeing to relax the terms of an existing €2.5 billion loan. Moscow has been angered by the plan to tax bank deposits but has larger business interests in Cyprus, which would suffer severe damage in the event of financial collapse. Moody's rating agency estimates that Russian banks have lent $30 billion to $40 billion to Cyprus-based companies of Russian origin, equivalent to up to 20% of the banks' capital base.